Tis the season for gathering with friends and family. A beautiful season that can easily become busy and hectic. We try very hard in our family to slow down this time of year and enjoy those special little moments that only happen once a year. Along this vein of simplifying the holidays I wanted to share with you today how to put together a simple, and delicious, pie bar that you can share with your loved ones this season. I promise this is easy and your guests will be impressed, but you won’t be working all day to pull it together. Slowing down, simplifying, and taking in those special holiday moments is such a treat. But all too often we get swept up in the fast-paced holiday traffic and before we know it those moments are gone. Hosting guests for a holiday party is one of those things that can get stressful quickly. 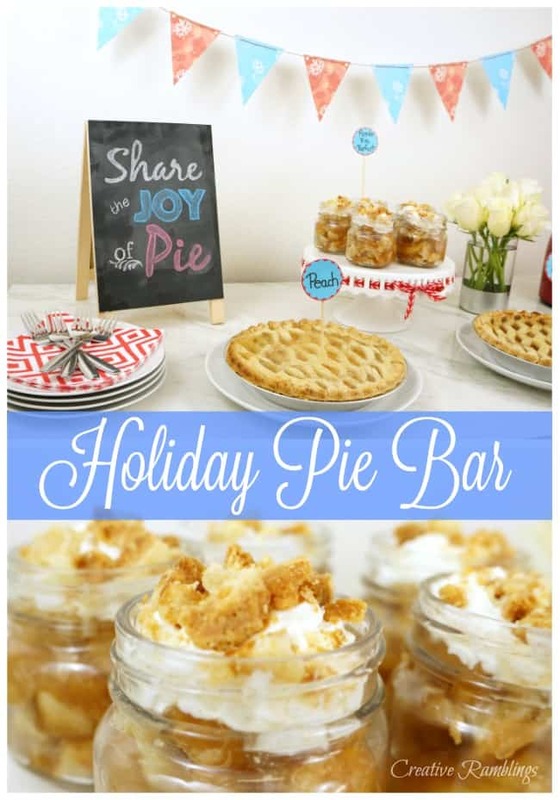 Instead of worrying about a meal plan and decor take a look at this easy and delicious holiday pie bar and use these ideas at your next get together. This is easy to put together, I even included a printable banner for you, and you will be able to relax and enjoy your party once this simple bar is set up. The stars of this pie bar are Marie Callender’s® Dessert Pies. These delicious pies come in a variety of flavors and are so easy to make. I love that they taste homemade, yet all I have to do it pop them in the oven. I picked up a few pies at Walmart for this pie bar; Razzleberry, Lattice Peach and Lattice Apple pie. There is a nice selection in the freezer section to fit every taste. I popped my pies in the oven according to the directions then set up the bar. I started with a white cake stand and white dishes, then added a few red and blue accents. I find a simple display makes the food stand out. 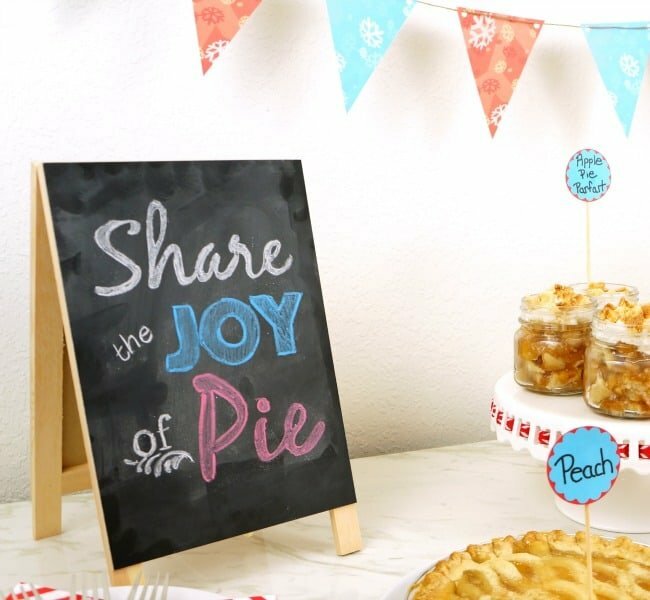 I added a chalkboard with Share the Joy of Pie on it and a red and blue snowflake banner. Download and print the red and blue snowflake banner here. When my pies were done I laid them on the bar with simple labels. These were so easy to make, just circles of red and blue cardstock taped to wood skewers. 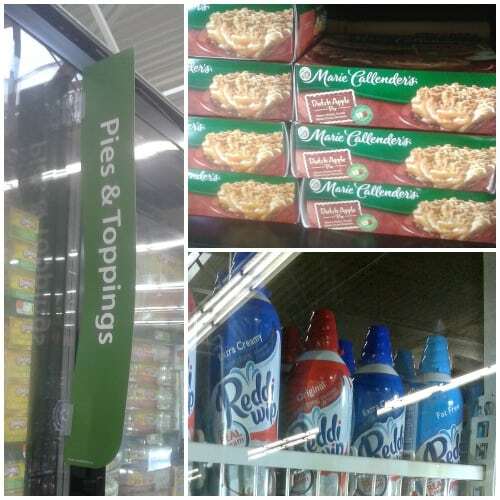 To add a little more interest to this pie bar, I made Apple Pie Parfaits with a cooked Marie Callender’s® Lattice Apple Pie and Reddi-wip®. 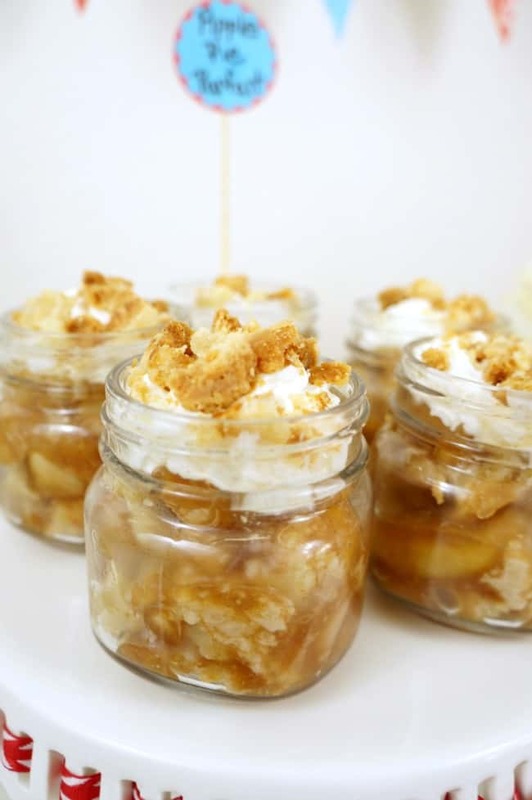 Here’s how to easily put together these delicious apple pie parfaits. Using a Lattice Apple Pie, break off the outer crust, remove the top lattice and set aside. Layer some lattice crust in the bottom of each jar. 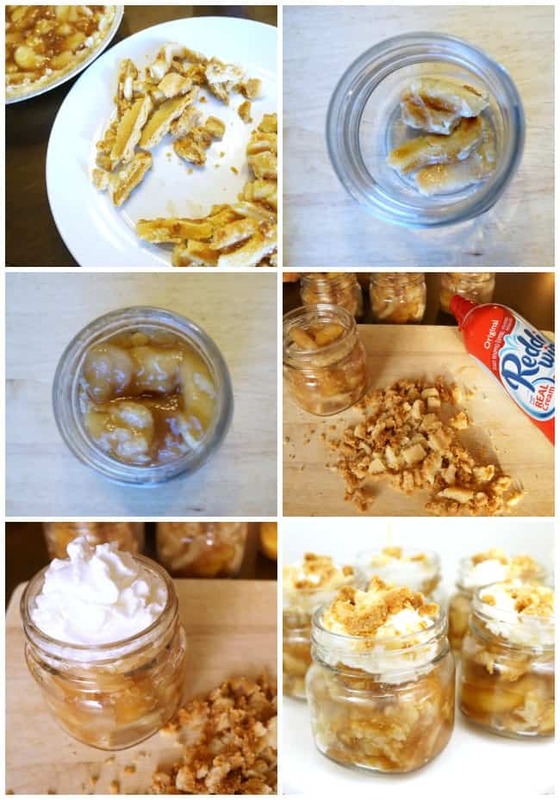 Fill each jar with apple filling. To finish off this pie bar I set out some coffee, brought in some fresh flowers and arranged the apple pie parfait jars on a cake stand. This simple pie bar can be put together in the time it takes to bake a pie. Your guests will love the comfort of pie and the laid back atmosphere of this party. 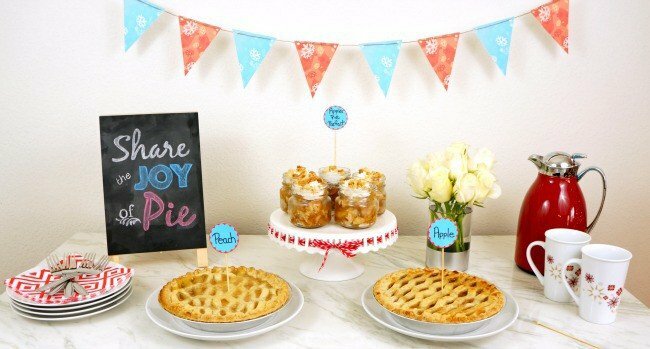 Find more Marie Callender’s® inspiration here and tell me how you will share the joy of pie this season?